Darjeeling, Aug. 8: Over 100 supporters of the CPRM took out a rally in Darjeeling today in support of the ongoing agitation for Gorkhaland and joined a procession of the Gorkha Janmukti Morcha in a show of unity by the two rival parties for the first time. The Morcha today organised several processions. 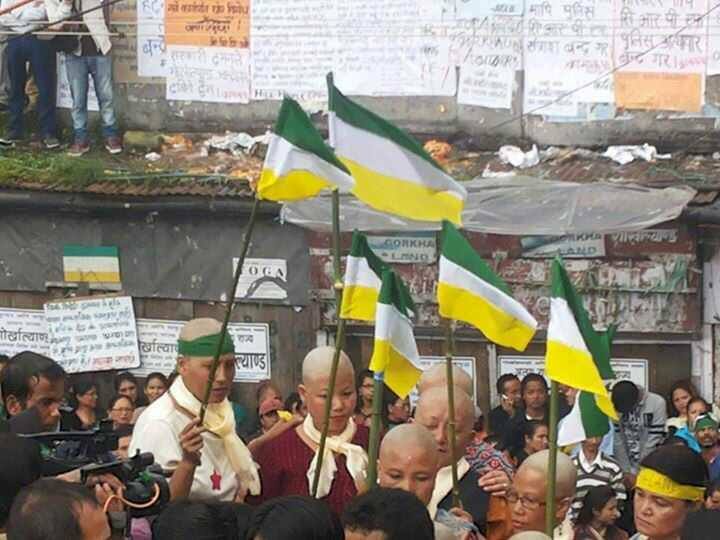 During one such march, eight women got their heads tonsured, a differently-abled person tried to burn himself and a youth etched a “map” of Gorkhaland with a blade on his back. 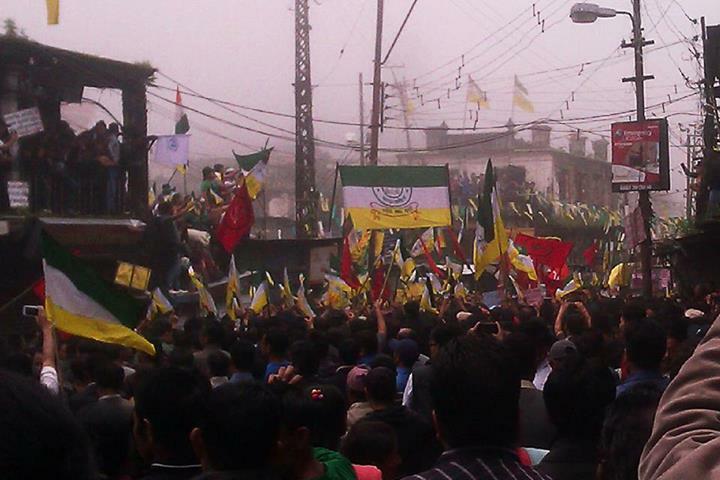 Observers believe the protests that Darjeeling witnessed today would pressure Morcha president Bimal Gurung to harden his position on statehood. The joint rally today happened days after Gurung asked all parties in the hills to fight for Gorkhaland together. The CPRM workers joined the Morcha supporters at Chowk Bazar. The Morcha supporters present at the market square cheered the CPRM workers. Barbers shaved off women’s hair after the combined rally of the Morcha and the CPRM culminated at Chowk Bazar. In an emotionally-charged atmosphere, Phurba Sherpa, who had lost his left hand in an accident some years ago, wrapped a cloth around his right hand and tried to set it on fire. Sherpa and other Morcha supporters were moving towards the district magistrate’s office in a procession. Others in the rally immediately doused the flames even though Sherpa’s hand has been burnt. He has been admitted to the Darjeeling Sadar hospital. “I had made up my mind to self-immolate for the cause of statehood. But some people doused the fire. I do not regret the incident,” said Sherpa, 32. In another rally, Nagen Subba, the president of the Gorkha Janmukti Vidyarthi Morcha (Lebong constituency), used a blade to etch a map of Gorkhaland. “In Telangana, the students had actively taken part in the agitation for statehood. We want to show that the students of this region are also participating in the agitation,” said Subba, 29.